The First Nations of the Northwest coast of British Columbia have a long and vibrant history, one that includes numerous myths and legends that they carved into their stories as well as their totem poles. So much of that history has disappeared, along with the villages that dotted the coastal waters. Europeans came, took what they wanted in lumber, fish and wildlife, pillaging the landscape, leaving dark, cavernous stains where thick, luscious forests once graced the shoreline. But the myths and legends didn’t really die. The Sasaheva, the wild man, and Tsonoqhah, the wild woman, both mythical creatures of the forest who shared their visions with the humans who sought to care for the land, they remained. For now. But the ravages of human greed will soon have their way with the wild creatures as well, until all that is left is steel and concrete and what so many would call civilization. Ian and Amy are on an adventure, sailing along the British Columbia coastline from Victoria to Alaska. At Hurst Island, just off the northern point of Vancouver Island, their journey takes an unexpected turn when their sailboat, Ian’s pride and joy, hits the rocks. They manage to make it to the south shore with only the clothes on their backs, just as the boat sinks. The beautiful scenery that they had marvelled at from the boat now looks rather sinister and foreboding and their trek across the island in the hopes of finding help proves to be terrifying in ways neither one of them understands. But connecting with two First Nations men who come to their rescue, they soon learn that their journey is not over and that a spiritual journey is necessary, not only to educate Ian and Amy about the past and what the future might hold, but also how they might help in saving this pristine beauty for generations to come. 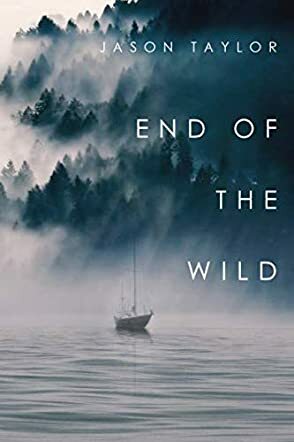 Jason Taylor’s novel, End of the Wild: Shipwrecked in the Pacific Northwest, is a journey of education, ecology, history and discovery. The plot develops at a good pace, weaving intricate past memories and events with the present and the future. History is told with accuracy and the plight of the First Nations, and the land they nurtured for many thousands of years, is told with riveting accounts that will make the reader think twice before plundering the valuable resources of nature. The characters are certainly believable and well developed and the descriptive parts of the narrative are as vivid as the images they describe, a real painting in words. Having lived for many years and explored the Northwest coast of British Columbia, this story captured my heart and my spirit at once. Brilliantly told with powerful messages to share. End of the Wild: Shipwrecked in the Pacific Northwest is an historical adventure novel written by Jason Taylor. Ian was stunned when he woke up to the sound of his boat breaking up and felt the icy sting of cold salt water rushing past him. His sailboat was a part of him; a wooden craft with a rich past that had come alive again under his care. The trip to Alaska was the culmination of all his work and dreams, and it had finally begun to feel like a reality. Amy had seemed experienced at sailing when she approached him and asked for a chance to crew with him, and her work as a helmsman had been beyond reproach. There should not have been a problem with his giving her the helm while he took a well-deserved nap, but somehow the boat had run aground. The two barely managed to get off the sinking vessel as the winds blew strong and waves crashed about them. Ian held tightly onto Amy as they clambered over the rocks and fought the tides to reach the shore. They were met by a pebbled shoreline where Ian recognized the remnants of a First Nations village site. He judged, based on their location before the crash, that they were on Hurst Island, a Provincial Park that would be deserted as it was off-season. Their first priority was to get out of the bitterly cold wind and somehow dry their clothing. Then they’d have to find a way to contact the outside world. Jason Taylor’s historical adventure novel, End of the Wild: Shipwrecked in the Pacific Northwest, is a well-written and exciting tale that combines elements of First Nations mythology, history and time travel in a tale about shipwreck survivors whose experiences on Hurst Island are life-changing. I loved the Pacific Northwest location the author chose for this story and especially enjoyed watching as Ian and Amy interact with Richard, Tmustsa and Norm, the First Nations people who discover them on the island. Taylor deftly weaves past, present and future in this thought-provoking novel featuring authentic characters and incredible natural landscapes. End of the Wild: Shipwrecked in the Pacific Northwest is most highly recommended. End of the Wild: Shipwrecked in the Pacific Northwest by Jason Taylor tells the story of a voyage of discovery. Ian recruits Amy to help him crew his sailing vessel to Alaska. On her first night watch, the boat capsizes in a fierce storm and she and Ian are washed ashore on remote Hurst Island off the coast of British Columbia. What should have been a safe haven turns out to be anything but, with mythical creatures, a strange fog, and an unseen force that threatens their very existence. They need to leave the island, but the more they try, the harder it becomes. The author, Jason Taylor, clearly has a good nautical knowledge which comes through in his writing, and gives this rather unusual story a high degree of authenticity. Hurst Island is a place where reality meets myth and legend and, although a surprise at first, as the reader was expecting a straightforward sea adventure, the descriptions and characters give the strange, hostile environment credibility. A well written story in which the author weaves a tale of intrigue and mysticism whilst playing with the minds and sanity of the characters, yet still manages to instill a sense of purpose and a little drop of romance. The pace is consistent, if a tad sedate, but page-turning nonetheless, with a satisfying ending. Credit must be given to the beguiling book cover and to the book synopsis which is bound to draw in a browsing reader. The fact that Hurst Island actually exists and is not the product of the author’s imagination was a surprise, but a strangely satisfying one.